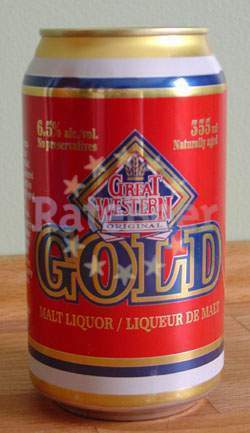 This premium malt liquor is hand crafted with time honoured brewing tradition and is naturally aged without preservatives. Our original recipe and the finest ingredients guarantee consistently superior quality and taste. Can @ AirBNB Arts Colony. I believe this is the correct entry...can just says Great Western Gold Strong 6.3%. Clear golden pour with white foam. Nose is sweet cooked apple and apple juice. Some corn, cereal grain, and a bit of soap. Maybe some metal. Flavor isn’t too bad either...sweetness kind of gets to you if it warms up at all (sort of headache levels of corn syrup flavor). Grape juice, apple cider, and some bitter metal. Grainy finish. Not horrible. 355ml can pours a darker straw color with a white head that settles quickly leaving no lacing on the glass. Aroma is grainy. Taste is undesirable hop bitterness and light malt sweetness. Just can’t believe I keep trying these crappy beers. Swill. Dumped in to glass. Made lots of rocky white foam which died shortly after. Standard lager gold with ok effervecance. This crap is teetering between horrid swill and acceptable swill. DRINK IT COLD AND QUICKLY!! Aroma comes across early on as low quality stinky malts and such but does gain a bit more of a sweetness within minutes of the pour but still maintains that poor mix of both. Nothing too offending though. As for the taste - grain and malts, sweetness and obvious alcohol on every chug. Most sips are decent enough but then you get hit by the alcohol. Leaves an unpleasant taste in the mouth. Light medium bodied with a thick viscous impression in the aftertaste. Notable bitterness, especially mid-sip. Excessive alcohol taste. This stuff is made for people who look for pennies in conveniece store parking lots to chug ice cold and then puke after funnelling 12 cans in 19 seconds. I’m slamming it so hard because the description at the top of this page claim "GOLD medal winner in the Midwest Brewer’s Festival, 2000". Uh, ok then. Maybe it’s only competitor was a can of varsol. To rate this really bad is probally an injustice. I recommend to myself that I have a swill-off with local liver-bashers to determine what discount canned lager is truly king for the less fortunate. Hey!!!!! Right on the can - "Return for refund". Hell yea! I’m gonna get my $1.49 back!!!! I can’t believe this glorified lysol is up for rating. if you drink this you either live in a trailer, on a reserve, or in a van... down by the river! from a 12 oz. bottle. Very mild aroma. Somewhat bitter palate with a sweet and alcoholic finish. Not bad. Great looking can made me decide to give it a whirl. On the first sip I’d have rated this much higher, it tasted great. But the aftertaste wasn’t pleasant, as it was predominantly alcohol and seemed to resemble the aftertaste of hard liquor instead. And, it lingered for way too long with a thicker residue than I prefer. But nonetheless, it went down easy and I somewhat enjoyed it. awww man. Talk about wrecking the palate. Why is crap like this even at a beer festival? An insult to taste buds everywhere. Sample at Beerfest 07. Yellow. Malt liquor aroma. Tastes like malt liquor, what an achievment. Yellow/Amberish pour, nice thick head on the pour. No stong scent. High carbonation. Normal malt liquro taste. A tad bitter in the mouth with a sweetish finish. Aftertaste lingers a bit more then is pleasant.